Blood-brain barrier - The barrier between the brain and the blood that allows the brain to maintain a cerebrospinal fluid composition different from that of blood. Coma - A state of unconsciousness from which patients cannot be aroused, even by the strongest stimuli. Meninges - The three membranes covering the brain and spinal cord: the dura, arachnoid, and pia. Meningitis - Inflammation of the meninges, often caused by viral or bacterial infections. Seizure - A sudden and transient disturbance of mental function or body movements that results from an excessive electrical discharge of a group of brain cells. Stroke - Sudden onset of symptoms caused by acute ischemia in the brain resulting from hemorrhage, embolism, or thrombosis, and evidenced by loss of neurological function. Subarachnoid space - The space between the arachnoid and pia membranes. Ventricles - Four cavities within the brain filled with cerebrospinal fluid and lined by the pia and the choroid plexus. Xanthochromia - A yellow coloring of the cerebrospinal fluid caused by the presence of breakdown products of hemoglobin. CSF is formed by the choroid plexus, presumably through the process of ultrafiltration and secretion. CSF is absorbed by the arachnoid villi of the dural sinuses. The character of CSF indicates that it is an ultrafiltrate with modifications, a dialysate which is in hydrostatic and osmotic equilibrium with blood. The blood/CSF barrier is similar to the blood/brain barrier, and CSF solutes resemble those in cerebral extracellular fluid. Alcohol penetrates these barriers rapidly. Penicillin penetrates these barriers slowly. Urea, creatinine and glucose are intermediate. Gases are rapidly exchanged, ions slowly. 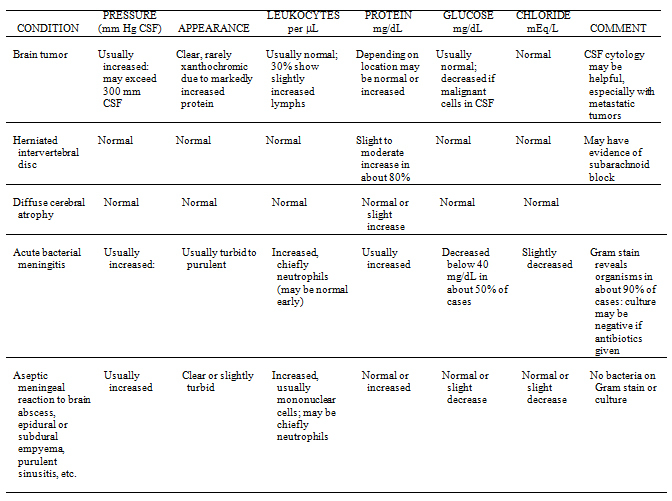 If changes of these solutes in blood are rapid, the concentration in CSF lags behind those in blood (compared with changes in synovial fluid). Normal CSF pressure: 75 -200 mm of water (manometrically) with the patient lying on his or her side in a horizontal position. In this position the cisternal and lumbar pressures are the same. Low CSF pressure is of little significance. Pressure drops 5 - 10 mm of H2O for each mL of CSF removed. Pressures > 1000 mm H2O are seldom seen, because capillaries and veins collapse. Other causes of increased pressure are presumably due to an increase in the rate of production of CSF (meningism), brain tumor, abscess, aneurysms, hematoma, cerebral edema, hemorrhage, and acute febrile disease. After the opening pressure is measured, collect a few mL of fluid in three portions using three separate collection tubes under strictly sterile conditions. Label tubes in order of sampling. Do not remove more than a total of 15-20 mL. Crenation of red cells is not a valid means to assess source of blood. Blood pigments from hemolysis may appear within 2-12 hours and may last 4-8 days. Xanthochromia: Old blood (hemoglobin) is converted into bilirubin, which appears after 12 hours and may last 12-28 days. Cell count must be done within 1 hour after removal since the cells may disintegrate. Infants have higher values, presumably because of immaturity of blood/brain barrier. Normally protein content is lower in CSF obtained from ventricular or cisternal puncture, higher in lumbar puncture sample. Protein elevation may be the only abnormality seen in certain diseases. It occurs in practically all organic CNS diseases. Measurement of CSF total protein is based on turbidometry after addition of trichloroacetic acid or sulfosalicylic acid; albumin and globulin may contribute differently to turbidity. Following treatment with Coomassie Blue or Biuret reagent, protein in CSF may be measured colorimetrically. Increased CSF gamma-globulin may be seen when the total protein level is within normal limits. This fraction can be determined by protein electrophoresis. 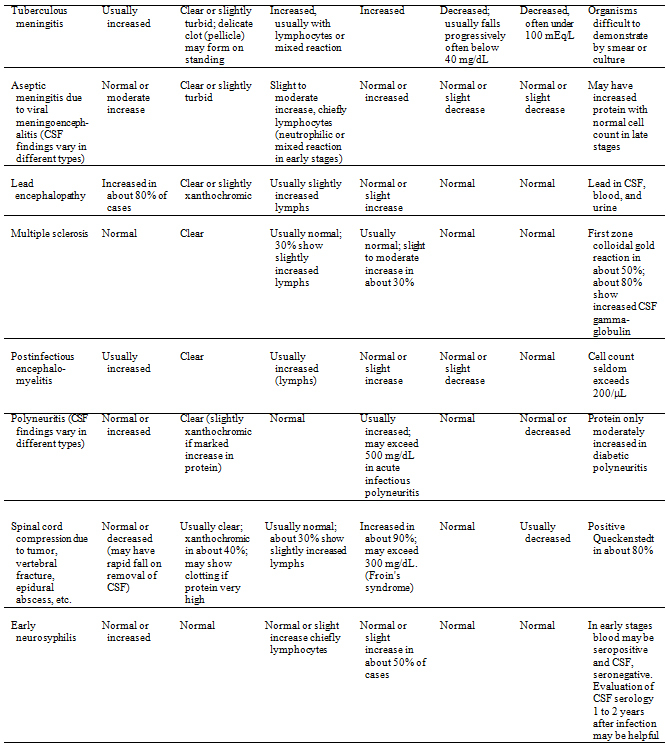 The technique requires at least 10 mL of CSF because of the need to concentrate samples due to relatively low protein concentrations in CSF. The demonstration of multiple discrete bands ("oligoclonal bands") in the gamma globulin region (which are not present in the patient's serum electrophoretic pattern) are useful in supporting the diagnosis of multiple sclerosis (MS). The sensitivity in using oligoclonal bands to aid in the diagnosis of MS is 70-95%. Both the specificity and the predictive value of positive tests have been reported to be about 85%. Such bands are usually IgG and occasionally IgM. About 10% of patients with MS do not have oligoclonal bands in their CSF ("false negatives"). Oligoclonal bands have also been reported in other diseases such as amyotrophic lateral sclerosis, Guillain-Barre syndrome, meningoencephalitis, neurosyphilis, spinal cord compression, and subacute sclerosing panencephalitis. Myelin is produced by oligodendroglial cells and is a major component of the white matter. Myelin is 70% lipid and 30% protein by weight with the protein portion consisting of 20% high molecular weight protein, 50% proteolipid, and 30% basic protein. Myelin basic protein (MBP) is strongly basic. It has a pI of 12 and a molecular weight of 18,600. With the breakdown of myelin, MBP is released into the CSF. The measurement of MBP is not a diagnostic test for MS but does provide an index for monitoring active demyelination. MBP is also elevated in diseases other than MS such as amyotrophic lateral sclerosis, presenile dementia, metastatic CA to the brain, cerebral palsy, cerebrovascular accidents, head trauma, meningoencephalitis, multiple myeloma, and spinal cord compression. The CNS synthesis rate of IgG by B cells infiltrating areas of active demyelination is a useful parameter for monitoring disease activity in multiple sclerosis. (Must be done in conjunction with serum glucose). A decrease is seen in bacterial meningitis (leukocytes are stimulated to more rapid glycolysis by bacteria). A decrease is noted with tumors of the meninges due to heavy neutrophilic reaction or widespread metastases. Increase is seen in trauma and diabetes. CK elevated in cerebral infarction. If CK-BB is measured, preservative is required. 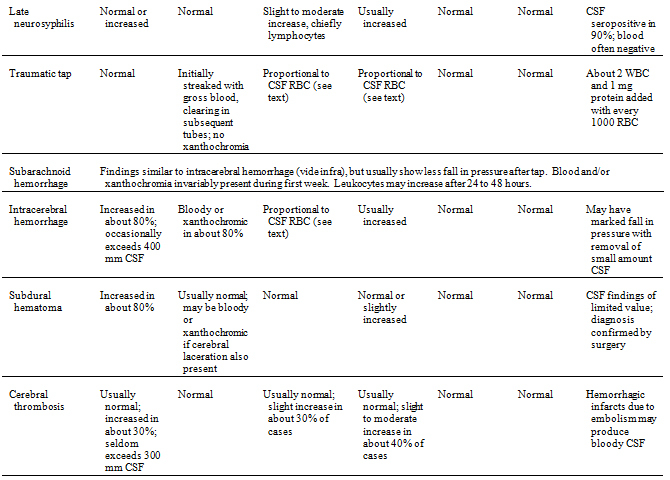 Adapted from Page and Culver: Laboratory Examinations in Clinical Diagnosis. Cambridge, Harvard University Press, 1961. Gently swirl the fluid in the test tube for thorough mixing, because cells may have settled upon standing. Do not shake vigorously as this may destroy cells and foaming may interfere with the testing procedures. With the aid of a pipet transfer a sufficient amount of the well-mixed fluid into the counting chamber of the hemocytometer to fill the space between the coverslip and the raised area of the counting grid completely and without air bubbles. Place hemocytometer onto the mechanical stage of the microscope and secure with the clamps. With the low power objective (10 times magnification) visualize the upper left hand large square,* which with this magnification should be entirely visible in one microscopic field. Adjust the lighting and substage condenser for best contrast and cell visualization. Count the white cells in all nine large squares. Since the volume thus counted is 9/10 μL, the result is multiplied by the fraction 10/9 to convert the number of cells counted to the number of cells per μL. Count the red cells in all 9 large squares, multiply the result by 10/9 and report number per μL. Scan entire area filled with fluid for formed elements other than white cells or red cells. 1 mm long x 1 mm wide x 0.1 mm deep = 0.1 mm3 = 0.1 μL/square = 0.9 μL/whole hemocytometer. Chemical Examination: as indicated by clinical condition. Microbiological Examination: as indicated by clinical condition.